Discharges 90° to the right of the load side into an existing mix tank. Designed to fit inside an existing 103” long x 46” wide x 96” high enclosure. 500# lifting capacity, 38” discharge height. 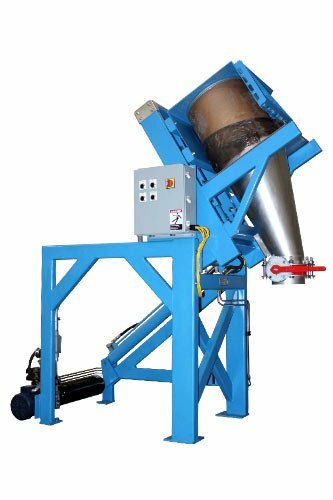 MTS Lift & Seal™ system seals drum to pour cone for dust-tight discharge. Includes custom docking cover with dust take off (not shown) for existing mix tank. Sealed cam rollers on “seal” carriage for smooth, reliable operation. “Zero-Force” safety touch button for enhanced operator safety. MTS exclusive two-speed hydraulic circuit.